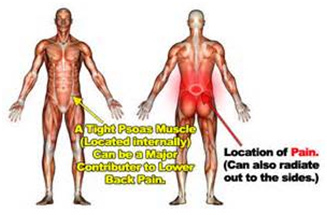 The most common issue faced by golfers is lower back pain, caused by how the body is positioned over the long run. Your body will always do what you ask of it in the short term even if it leads to excess strain and pain. This makes perfect sense when you’re in survival mode but not when it comes to longevity in sport. Generally speaking we are fortunate that improving pelvic awareness and positioning not only leads to less injury but improved performance. While playing golf, the body generates rotational speed, mainly through movement of the feet, hips, torso and shoulders. As golf revolves around the hips, most golfers still have poor hip awareness throughout their swing. This lack of awareness can lead to two main problems: They do not lead with their hips on the downswing and often start off at a rotational disadvantage as their pelvis is tilted forward. Each flaw leads to back pain from two different origins: If you don’t lead with your hips with the downswing, you cannot effectively transfer power from the lower body to the upper body to the ball. That leads to the power of your swing, which is being initiated by your low back and torso. It is easy for those areas to get overworked and eventually lead to pain. If you start your swing with an excessive forward tilt of the pelvis, you will literally run out of room for movement in your hips and begin to compress your low back; causing pain for either your hips, low back or both. To avoid complications, you can examine yourself to determine whether you experience an excessive forward pelvic tilt. Simply swing your club in a subtle manner with varying angles of pelvic tilt and observe the changes in your swing. If you require a functional exam and/or information on common and less common golf injuries, please book an appointment with Dr. Jon Morrow. Appointments with Dr. Morrow can be made at our Athlete's Care Hamilton or Athlete's Care Mississauga locations. Ever wonder why some people experience chronic pain? Why some people seem to recover from an injury within weeks while others continue to experience symptoms months or even years after? 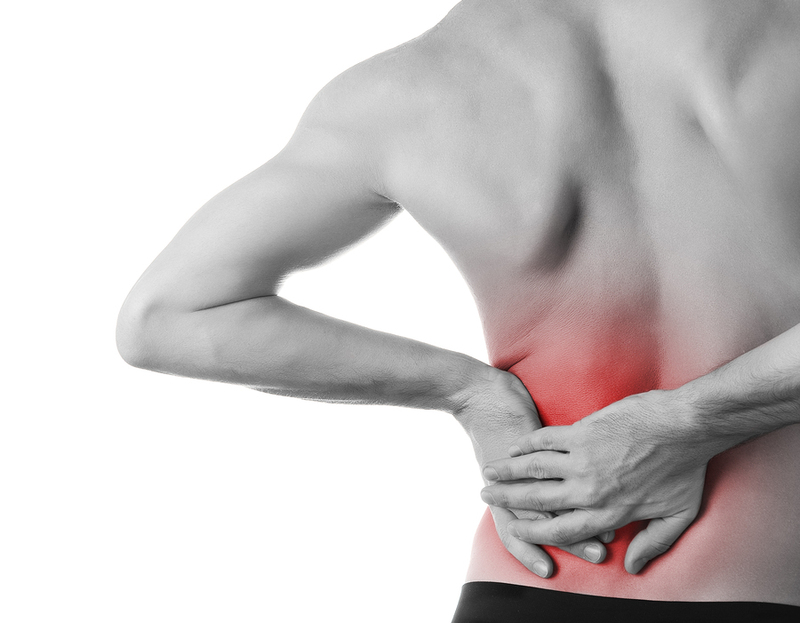 Chronic pain is defined as any persistence of pain beyond three months duration. There are many factors, both physical and psychological, that affect whether a person will feel pain and how long that pain will last. Just like physical stimuli, thoughts and behaviours have the capacity to open/close the gait, thereby amplifying or dampening the pain. 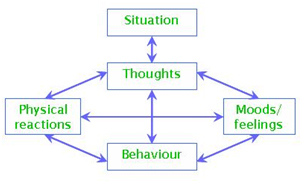 Cognitive behavioural therapy (CBT), begins with the premise that maladaptive beliefs and behaviours play an important role in the maintenance or exacerbation or mood, anxiety and somatic problems. People have beliefs, coping deficits and behavioural responses which make sense in situations involving acute pain but which become problematic in cases involving prolonged pain. An Athlete’s Care chiropractor trained in CBT principles can work with the patient to bring these thought patterns to the surface to determine whether the patients’ reactions to situations are accurate. Through CBT, thoughts and beliefs are categorized into 3 levels : Automatic thoughts, intermediate beliefs and core beliefs. Automatic thoughts are at the surface (most easily accessible), are typically specific to a situation, and are most changeable. Core beliefs are deeply rooted views we have about ourselves and the world. They are general statements. These are least changeable and we are often not conscious of these core beliefs. Intermediate beliefs are the level in between. They’ve been in an accident. They don’t want to have lunch with me. How rude. They always pull stuff like this. The above example highlights the various ways the mind and body can respond based on automatic thoughts that arise in a given situation. The resultant bodily reactions and behaviours can be quite different depending on the person’s internal thoughts and interpretation of the scenario. As Athlete’s Care chiropractors, we are trained in functional integrated therapy, patient-centered care and holistic health. 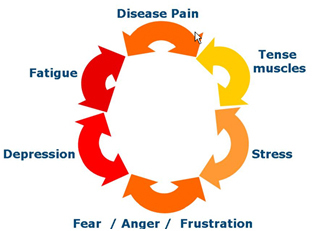 Often times with chronic pain, maladaptive thoughts and subsequent behaviours can keep a patient in the cycle of chronic pain, thereby preventing full recovery. By examining and challenging these thoughts using CBT principles, one can change the resulting behaviour, thereby affecting the sensation of pain. Dr. Pamela MacDonald is a chiropractor currently seeing patients at Athlete's Care in the Beach and at the new clinic in Etobicoke/Kingsway. By Dr. Amanda Scione DC., B.Sc Kin. Have you ever been performing an activity and then wake up the next day in pain…leaving yourself wondering what you did to yourself to cause this? Or how about when the pain is not going away despite treatment to the area?Have you ever wondered why therapists treat adjacent regions of your body that are not necessarily painful? Answers to these questions will be illustrated by explaining the principles of the joint by joint approach, how pain in one area may be caused by dysfunction in another, and how these issues can be resolved. Whether you engage in moderate or intense physical activity it is important for you to understand the following concepts. As a patient, it is important to understand the basics of how your body functions. This will make you more in tune with your body, and will allow you to feel when something is ‘not right’. The Joint by Joint Approach was coined by Michael Boyle and Gray Cook. Their analysis of the body is very straightforward. Our bodies are merely seen as a stack of joints. Each joint or series of joints has a specific function, and therefore, has particular training needs. Notice below that our joints alternate between mobility and stability. If the specific functions of each joint are not met, our bodies are prone to predictable levels of dysfunction. Problems at one joint usually show up as pain in the joint above or below. Let’s use the common condition of lower back pain to illustrate this. I am sure you know by now that if you have lower back pain you need to work on your core exercises. BUT, what you may not know is that this lower back pain probably evolved due to a loss of hip mobility. As we previously discussed, when we have loss of function in one joint (lower spine), we also get loss of function of the joint below (the hips). This means that if the lumbar spine can not move, the hips will instead. The problem is that the hips are designed for mobility, and the lumbar spine for stability. 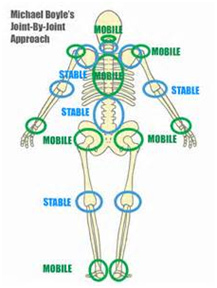 When the intended mobile joint becomes immobile, the stable joint is forced to move as compensation, becoming less stable and subsequently painful. Let’s analyze this pattern further. As shown in the diagram, decreased strength or activation of the psoas muscle will cause patterns of lumbar flexion as a substitute for hip flexion. Decreased strength or activation of the glut muscles will cause a compensatory extension pattern of the lumbar spine to replace the motion of hip extension. This cycle is a vicious one. As the spine moves to compensate for the lack of strength and mobility of the hip, the hip loses more mobility. Remember that the chain starts from the bottom. An immobile ankle causes the stress of landing to be transferred to the joint above, the knee- and the cycle continues up. Utilizing the FIT principle, the chiropractors at Athlete’s Care are equipped in identifying these patterns of altered joint mechanics as well as correcting them through many different treatment strategies. We find and treat the cause of the pain rather than focus on the source of the pain. Elite athletes utilize this approach for performance optimization. They are constantly assessed for altered joint mechanics BEFORE compensation and pain sets in. Visit your nearest chiropractor at Athlete’s Care to get your body assessed now! Dr. Amanda Scione is a chiropractor currently seeing patients at the Athlete’s Care Oakville location. Wait for upcoming news on the Hamilton location. Dr. Trevor Vander Doelen was recently interviewed by a CrossFit athlete about his approach to care for CrossFit athletes, injury prevention, and improving performance. To what do you attribute your success in treating CrossFit athletes and getting them back to their sport both pain free and performing at a higher level? CrossFit is an incredible sport that combines strength, stamina, and skill and every athlete has their own particular strengths and weaknesses. Similarly, all CrossFit athletes need an individualized approach to their care when they are injured. Every athlete is at a different level of movement quality, strength, and body awareness and as such needs to be treated differently. The foundation of my approach involves not just treating pain but more importantly correcting dysfunctional movement patterns. A thorough initial assessment involving a detailed history of current and past injuries as well as a movement-based assessment is an essential starting point for each athlete. Once movement dysfunction is determined, a detailed plan of how to correct this is discussed with the patient. Treatment predominantly involves Active Release Technique (ART), joint manipulation, and neurofunctional acupuncture, followed by a specific and progressive corrective exercise plan. What should I include in my warm up and cool down? Static stretching prior to exercise has been shown to hinder performance in explosive sports and therefore should be avoided prior to a CrossFit workout. However dynamic stretches to “prime” the nervous system should be done prior to exercise. These should include active movements of the ankles, knees, hips, spine, shoulders, elbows, and wrists in all planes of motion prior to starting the workout. Low back pain seems to be very common amongst the Cross-Fit community, what steps can I take to prevent low back pain? You are correct, many injured CrossFit athletes present with low back pain. Anecdotally, I find the main culprit with acute low back pain amongst these athletes is the deadlift and squat exercise. These exercises, when performed with correct posture, are great movements for functional core strength, hip strength, and shoulder strength. With that being said, when these exercises are performed without a neutral spine and without a good hip hinge it is only a matter of time before the athlete loads to the point of injury. My movement assessment is able to determine why an athlete moves poorly. As an example, I often find the core and gluteal muscles are inhibited (underactive) by facilitated (overactive) hip flexors amongst these athletes. Manual therapy and movement correction are very effective at helping these athletes recover and prevent this low back pain from returning in the future. How can I minimize shoulder problems? Unfortunately if you have had shoulder problems in the past, the likelihood of recurrence is increased. It is important to get the shoulder assessed by a health care professional that uses a movement-based assessment. Since the shoulder blade is attached to the ribcage and mid back by soft tissue structures (muscle and fascia) it responds very well to manual therapy, acupuncture, and corrective exercise. Typical shoulder injuries with CrossFit athletes involve subacromial and posterior internal impingement. Most of these athletes have facilitated (overactive) pectoral and upper trapezius muscles and inhibited (underactive) lattisimus dorsi and middle/lower trapezius muscles. This prevents them from keeping their arm and shoulder blade in the proper position during movement. While this is a typical presentation, I must emphasize again that no two patients are identical in their presentation; I often see dysfunctional core stability and hip mechanics with these same athletes. Addressing these dysfunctions through specific stability and mobility corrective exercises, a CrossFit athlete can effectively prevent shoulder pain. This is a common question that I get asked frequently from the CrossFit community. The best answer to this question is to get assessed by a Certified Strength and Conditioning Specialist (CSCS) or Chiropractor with a movement based assessment that has experience working with olympic lifting, power lifting, or CrossFit. I often address this movement dysfunction by comparing the body to a computer with a hardware vs. software analogy. The athlete requires stability and mobility from various joints and soft tissues surrounding them (hardware) and also requires efficient and safe movement driven by the nervous system (software). When assessing the “hardware” component I often reference legendary strength coach Mike Boyle’s joint-by-joint approach that states that certain joints tend towards certain types of dysfunction. Often the foot, knee, lumbar spine, cervical spine, and scapulothoracic joint have lost stability, and the ankle, hip, thoracic spine, and glenohumeral joint have lost mobility. Dysfunctional “hardware” responds well to corrective exercise and even better to corrective exercise in combination with manual therapy. A “software” assessment focuses on the athlete’s technique, body position, and muscle activation patterns and will provides feedback on the athlete’s specific approach to the movement. Modifying key factors like specific joint positions, and activation from the feet, through the hips, into the core, and shoulders helps create movement awareness and efficiency with the movement. Once the efficiency of the athlete’s squat movement has improved, the athlete can then progressively load their squat. This whole-body approach to squat correction prevents the most common issues with the movement, including low back pain, wrist pain in the front rack position, and allows for greater depth. This is the best way to make long-term changes to your squat for both injury prevention and performance. To summarize our interview, what last piece of advice would you give a CrossFit athlete who is interested in injury prevention and performance in this great sport? Empower yourself! Injury prevention and performance in this sport is completely within your control. Take an active approach to learning about your body by putting together a team of training and health care professionals that can both help you and teach you to help yourself safely and efficiently get faster and stronger for longer. Dr. Trevor Vander Doelen is a movement-based Chiropractor at Athlete's Care in Liberty Village, that helps recreational, amateur, and professional athletes perform better and return to their sport following injury. Warm ups  Can they enhance performance?